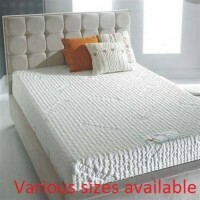 (90 x 190cm, 135 x 190cm or 150 x 200cm Mattress size). Description: A strong shaker style bed, with horizontal tops to head and footboard. A bed with the character that commands the bedroom. Matching furniture available from our Kendal bedroom furniture range. Super range ideal for everyone, homes, hotels, B&Bs, Nursing Homes, Buy to lets etc.